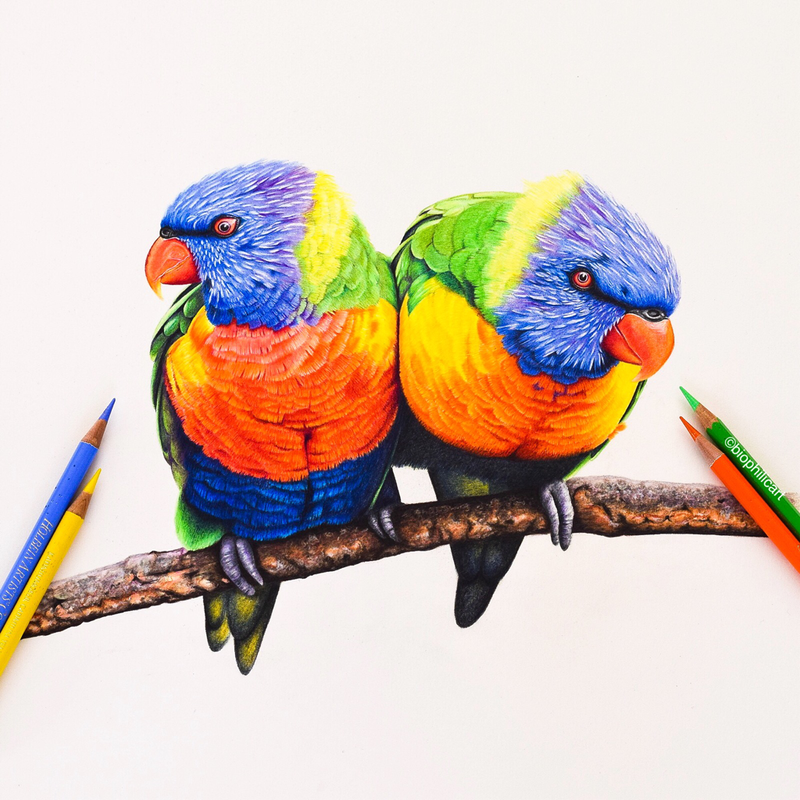 Two beautiful Lorikeets. I loved the expressions on the faces of this pair. 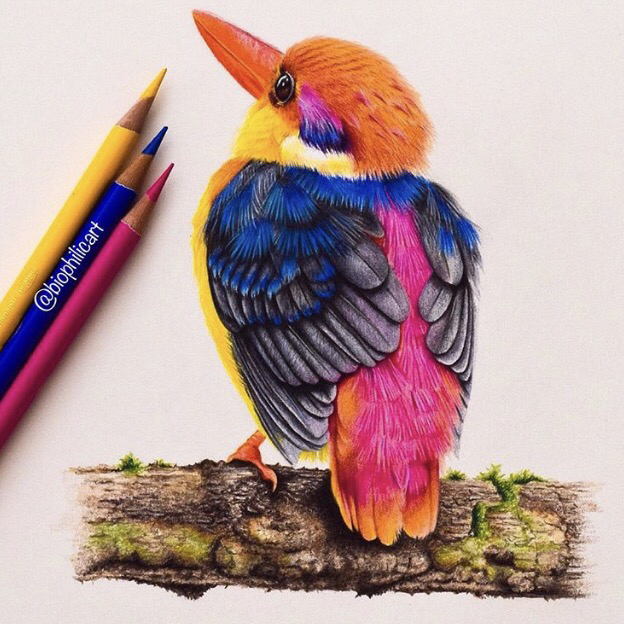 The beautiful reference photo came once again from the lovely @flutterby_di on Instagram. I have done a step by step guide to drawing tree bark to go with this piece which you can view by clicking on the link below. The Banded Broadbill is one of the strangest looking birds l have come across. I call it my Marmite bird, as people either seem to love it or hate it! I certainly thought someone had, had a bit too much to drink and had some fun with photoshop when l first saw it! I had to do some research to believe it! 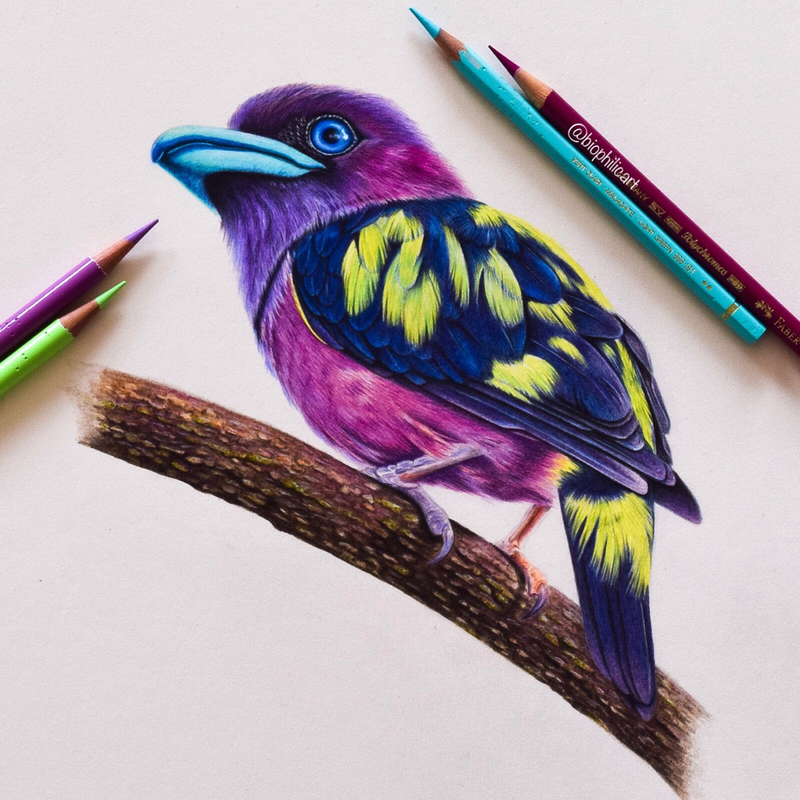 ​I have added a step by step guide to drawing the feathers on the chest of this bird. Click the link below to view it. 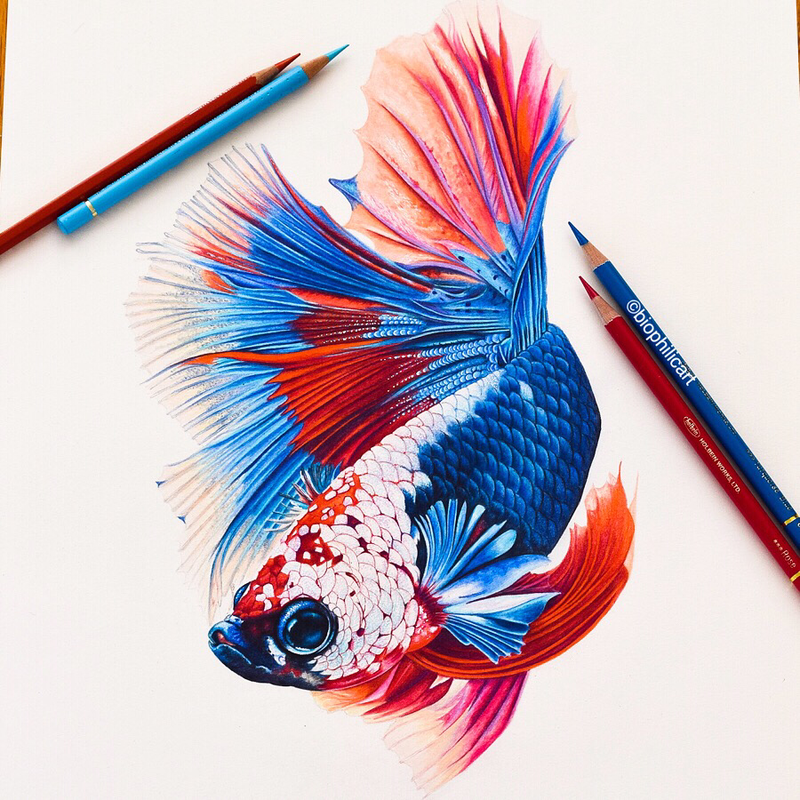 Siamese Fighting Fish, (Japanese Fghting Fish, Betta Fish or Half Moon Fish). I was so excited to draw this piece that l leapt out of bed at 4am every morning longing to get to my art room! 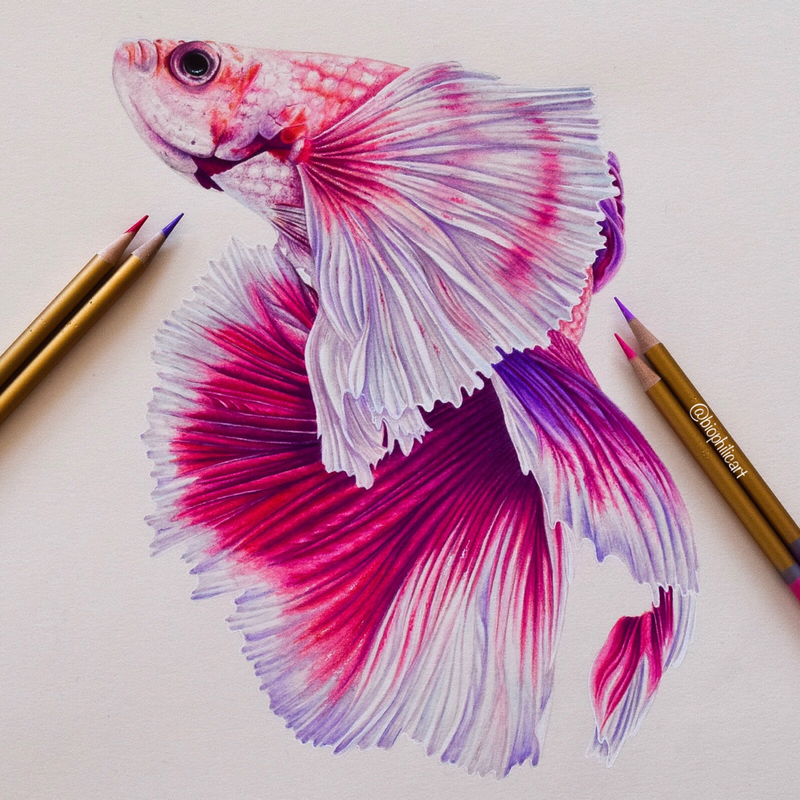 I loved it, it is such a colourful fish, with so much detail. Real fun to draw. Hummingbird 6 l think! It could be more! This one was worked with only Schpirerrfarben pencils, a new brand that l was testing out (l love them, check out my blog for full reviews). 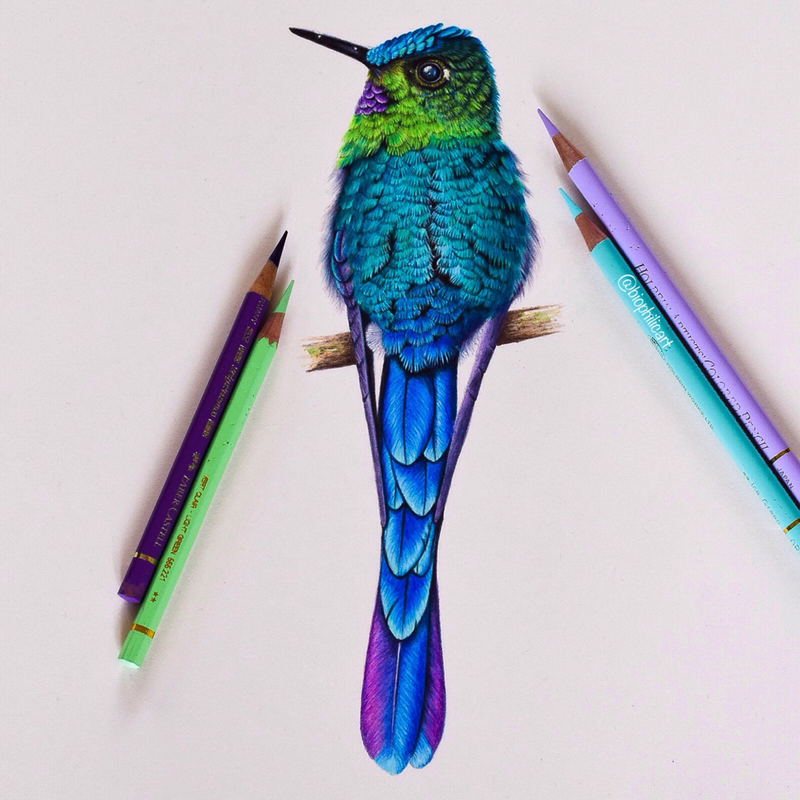 l redrew this gorgeous little hummingbird that l originally drew a year ago (check out my blog to see the comparison). I really wanted to do justice to this pretty little bird. You can, of course, check out my hummingbird feather tutorial on my tips page. 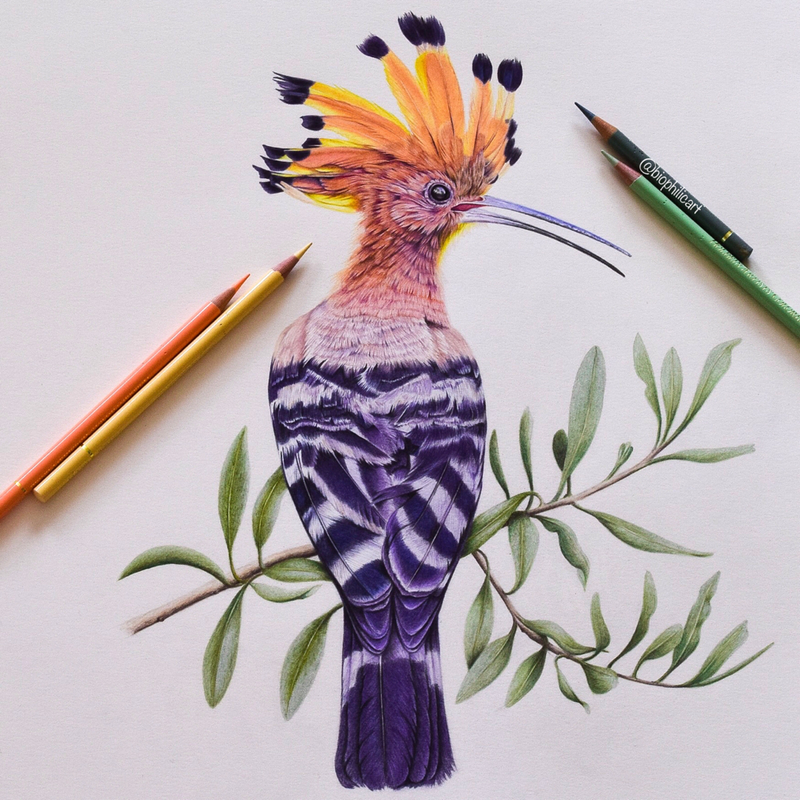 The Hoopoe is another bird that has been on my to do list for a while, for me it was really exciting to use a completely different color palette. The Hoopoe also has some unusual textures to the head and neck feathers which were a nice challenge. l really loved the unusual color combination in this gorgeous Betta Fish. I used reds from all my pencil brands (Faber Castell Polychromos and Caran D’ache Luminance and Pablo’s and Holbeins) for this piece. This is a very large piece. 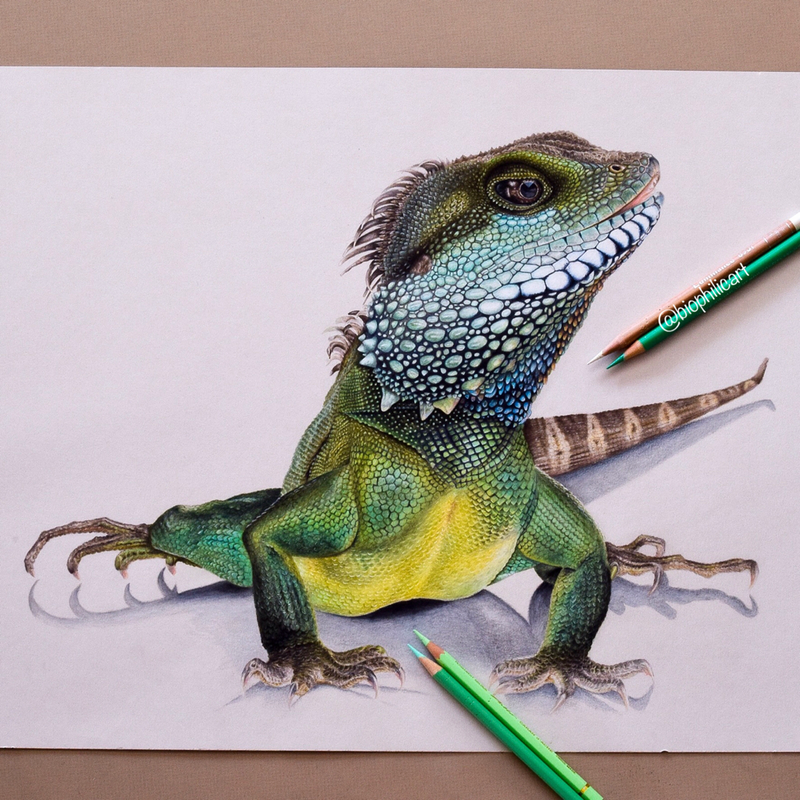 I have wanted to draw another lizard for a while, but to work bigger to get more detail in. This piece is drawn on grey Stonehenge paper. 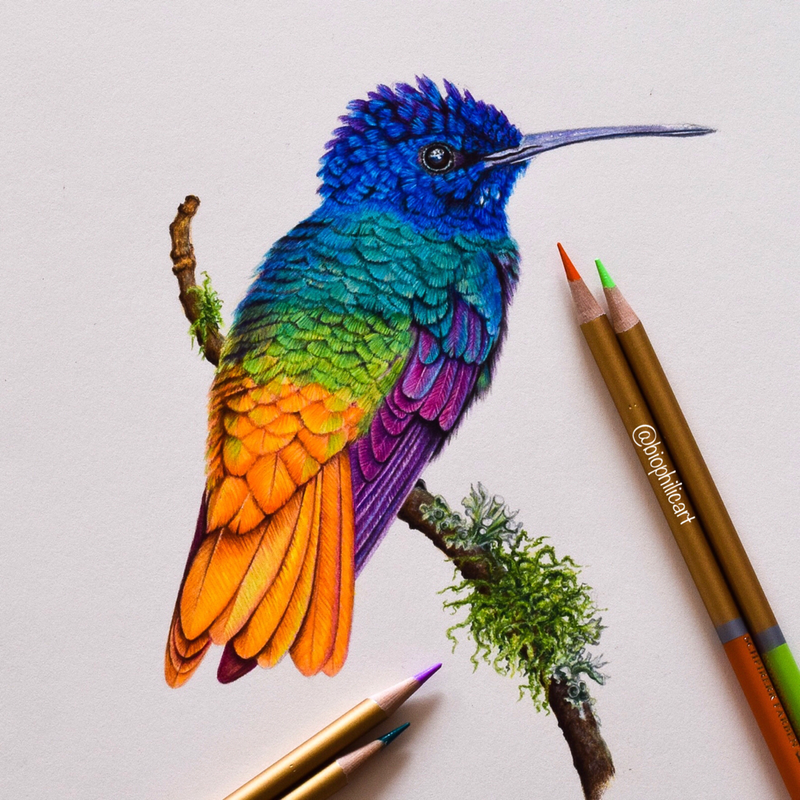 I was so excited to draw this gorgeous little bird, and l got to try out my new Holbien pencils too! They are so vibrant. You will find a step by step guide to drawing this type of feather on my tips page. Because you have to have a pair of Love Birds. 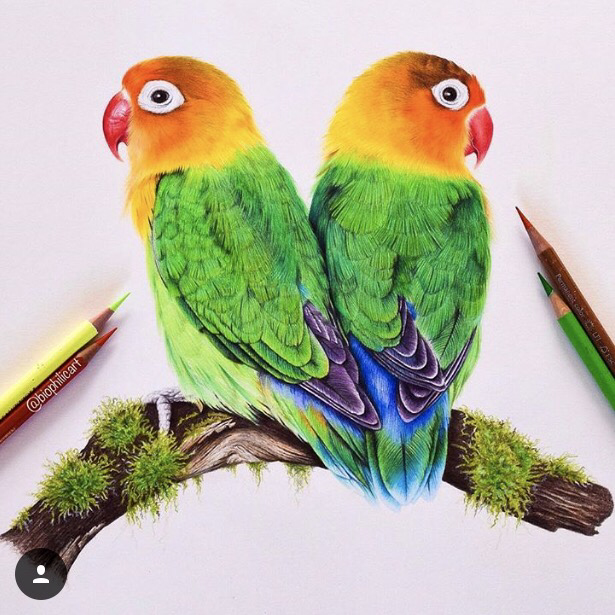 These beautiful birds pair for life, how could l separate them? 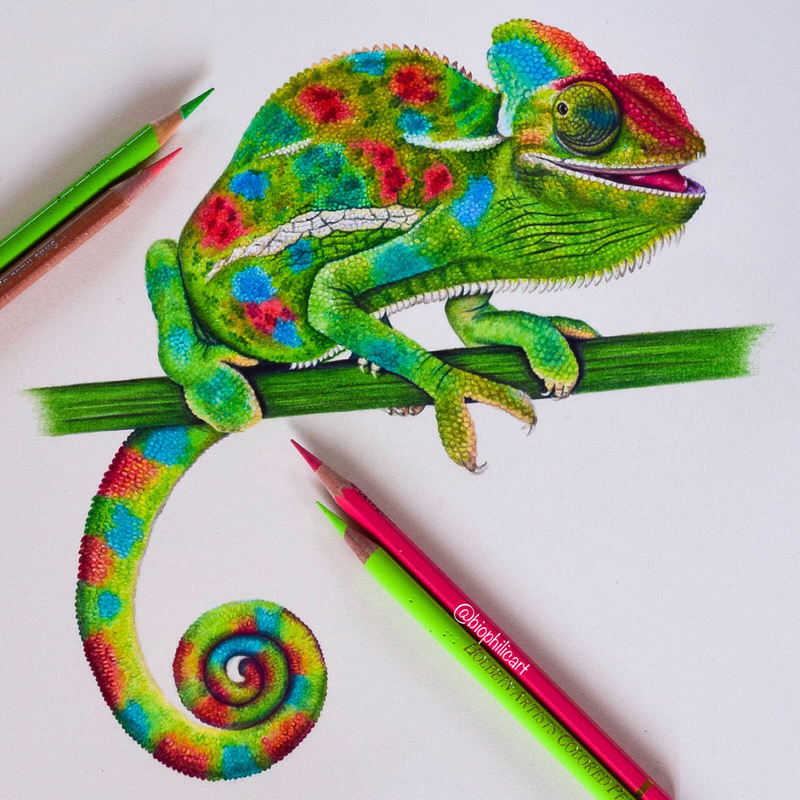 This chameleon captured me with his amazing expression. He just looked so cheeky! 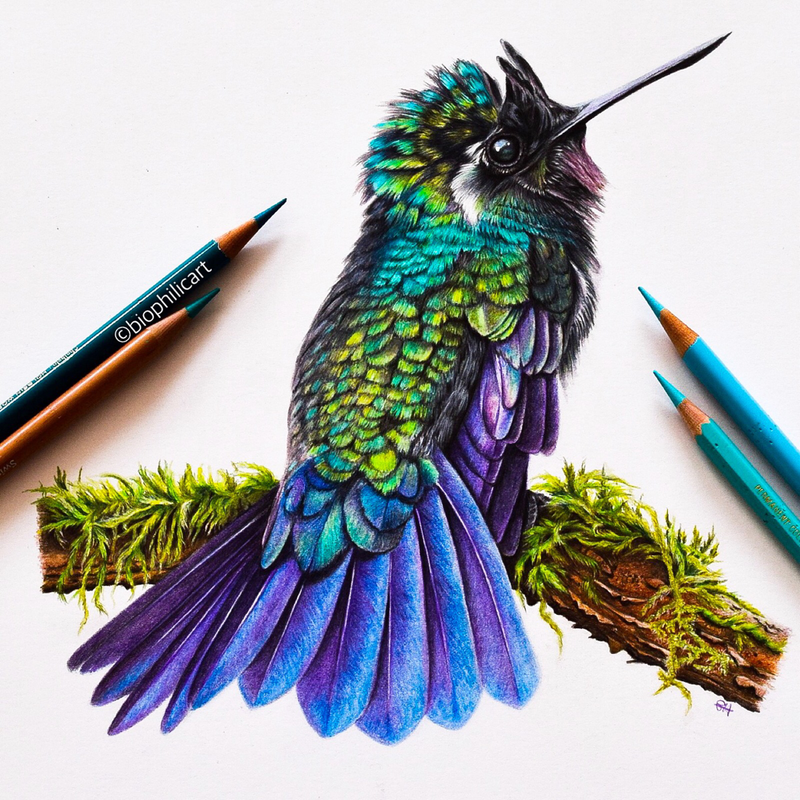 This gorgeous little hummingbird, a Mountain Gem was such a pretty little thing, and the colours so gorgeous that l had to draw it. I thought l would try my first mossy branch for him to sit on too. 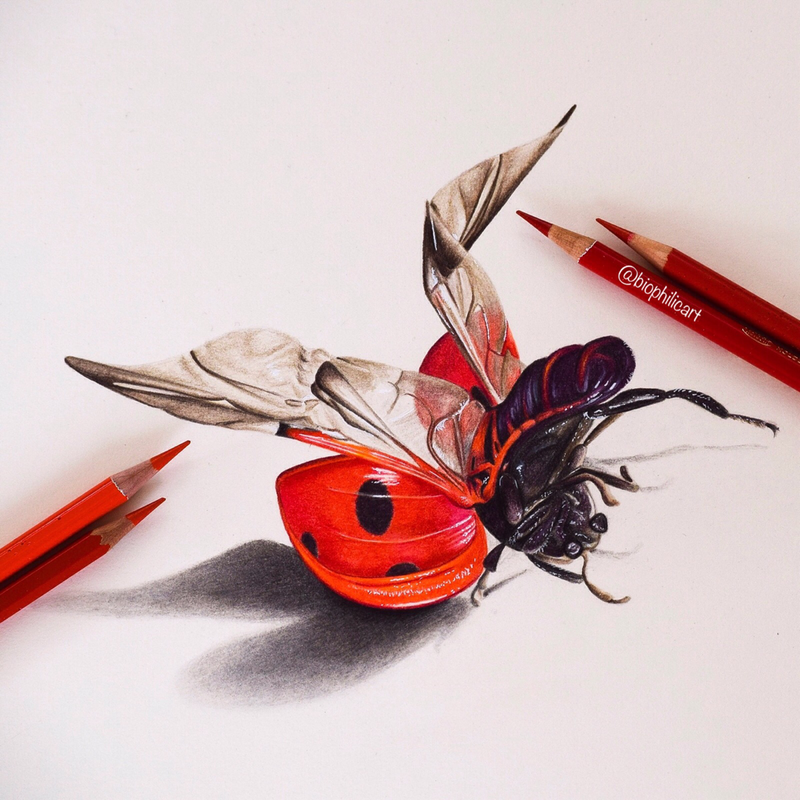 Ladybug/ Ladybird. I really fell in love with this photo as soon as l saw it. I love seeing the inside of the shell, l love the twisted wing, l love seeing the upper body. Siamese Fighting Fish 2, or Betta fish or Half Moon fish. I just couldn't resist drawing a second one and making a pair. They are just so much fun to draw.